Jean-Yvon stares directly into my eyes with the self-assurance and dignity of a man who once earned a living to support his family. 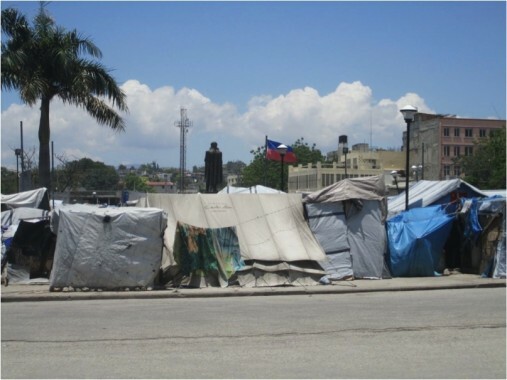 Today, he, his wife and their two children are sheltered in a twelve foot square makeshift tarp tent on the plaza across from the destroyed presidential palace in Port-au-Prince, Haiti. I am here with two sisters, LeeAnn and Lorin, and Lorin’s Haitian husband, Jagat. LeeAnn is my colleague; her sister has been offering humanitarian support to several communities down here since just before the earthquake. Jagat translates when we don’t understand the Creole. Annabelle is sixteen and her parents are both dead. She lives here with her stepparents, and had resorted to prostitution as the only way she could get food to eat. Some time ago, she was viciously attacked by a customer, and lay bleeding on the streets crying until finally people had come to help. I can see her wound all too clearly as she speaks to us; the end of her tongue is missing. My whole body shivers with chills despite the brutal humidity. Jean-Yvon is staring at me intently, friendly yet demanding. He doesn’t speak, but I can hear his voice as clear as the incessant blare of horns from the passing traffic: You see? It’s inhuman here. You need to tell the world. So I’m telling anyone who will listen. I’m working to help any way I can. 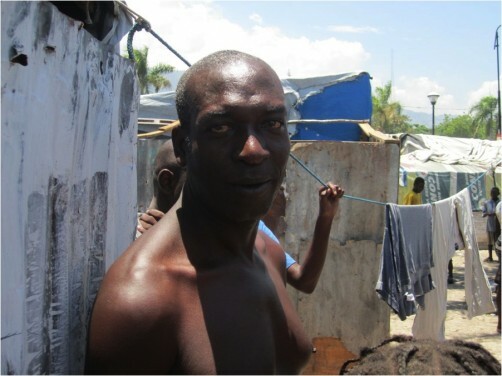 Haiti needs so much that even small gestures have a huge impact. LaL’s CEO Shayne Hughes and Executive Coach LeeAnn Mallorie traveled to Haiti to meet with the community leaders of Savenette-Cabrale and the founder of the Compassion School. Participants in LaL’s March 2011 Personal Mastery seminar generously donated over $7300 to provide training, school supplies and clean water to this all volunteer school serving Haiti’s poorest children. The world needs us all to be acting to help others in accordance with our Noble Goals. The tent camp just across from the destroyed Presidential Palace. The upcoming Presidential Inauguration will occur here and security officials are wondering what to do with the squatters. Annabelle tells us her story. Jagat, in red, translates. Lorin is to his left. Very clear and tactful. Thanks for sharing.